During that period of having given up, smartphones evolved and I took a liking to Runkeeper. Since the earliest runs I can find on Runkeeper are from 2011, that must be when I picked back up again. Not coincidentally, I picked up a Bluetooth heart rate monitor around the same time. This was pre-Bluetooth Smart (or BLE), so it actually paired with my phone and not the specific app. The cool thing was that it also transmitted Polar's proprietary signal, which worked with gym equipment, so I could see my heart rate on treadmills s as well. In 2013, I convinced my wife to let me buy the Garmin Swim. She grew up a swimmer and couldn't really understand why anybody would need something to track your pool workouts. I did not have that hindrance though, and the idea of tracking my swimming seemed magical. Finally a way to drop my 400m swim time to be sub-9 minutes! I dutifully wore my HRM until 2014, when the bug hit me and I wanted more gear. In 2014 I was tired of the shin splints and had tried many things to get rid of them, including c25k and barefoot running. I didn't really have the patience for either, but I decided that my stride was the root of my injuries and was what needed to be fixed. So I bought a Bluetooth smart foot pod - the Adidas MiCoach Speed_cell to help me increase my cadence to the magical 180 spm. Of course, since it used BLE, I had to get a a HRM that also used BLE, so I got the Polar H7. The Speed_cell was pretty new at the time. So new, in fact, that the Android version of the Adidas app didn't actually support it. So I literally bought this gadget with no way to use it. Luckily, it was only a couple of weeks before Adidas got their stuff in order and released an update to the Android app that enabled foot pod support. I used the foot pod and the HRM together for quite some time, eventually switching out of the Adidas app and into the Wahoo Fitness app, since it allowed much more flexibility with uploading activities to multiple platforms. Since I was now using the Wahoo Fitness app, and since I already had running and swimming covered in terms of gadgets, I decided it was time to upgrade my bike gear and I got the Wahoo RFLKT+. Basically, it was a fancy display for my phone and accessories, of which I only had an HRM at the time that would function with it. That didn't last for long, though, as a few months later I got a bike cadence sensor which also worked with it. That allowed me to keep my phone in my jersey pocket and still collect all the data for easy upload to multiple platforms, and display said data on a compact bike computer without completely killing the battery on my phone. But I was annoyed that the first part of my bike rides gave me bad HR data as I wasn't sweaty enough to conduct the electrical signal, so I went out and bought the Scosche Rhythm+ optical HRM in June of 2014. It is worn on my bicep or forearm, depending on whether I'm running or biking, respectively. Of course, I now run into issues with the Scosche giving me bad data for the first few minutes of my runs (it picks up my cadence and reports that as my HR), but I've decided I won't let that bother me (though it really bothers me). Then I came to realize that these three different gadgets (phone/foot pod, Garmin Swim, phone/RFLKT+) were great for individual training efforts, but didn't really work for an actual triathlon. The Garmin Swim has no GPS, so it's useless for open water swims and as soon as you get out of the pool. The RFLKT+ requires a phone to use, and I'm not about to bring a phone in the water with me. I had to rig up the phone in my bike pouch prior to the race and hope that it didn't die during the idle time leading up to the bike portion of the race. And after the bike portion, I couldn't easily take the phone from the bike pouch and change activities to track the run. And forget about transition times, obviously. It was probably around fall of 2014 that I started planting the seed in my wife's ear about a triathlon watch. 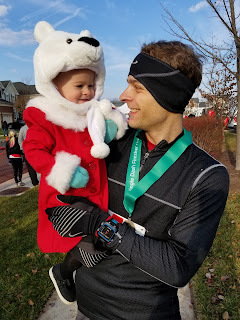 It was hard to justify spending $400 on a watch for the few races I was doing during each year, so I didn't end up getting one (until the beginning of 2016, actually). What I did in the meantime was to gift my wife a TomTom Runner - a GPS running watch, which happened to be waterproof to 50m (same as the Garmin 920XT tri watch). I borrowed it during a couple of triathlons with OK results. I had to dig into the TCX file it created and manually edit it to split up the activities, and the pool data were pretty bad, but it otherwise did a good job during race day. 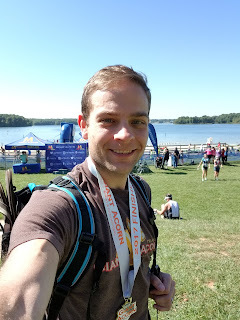 I run the South Riding Triathlon every year, and I did really well in 2014. I decided if I really wanted to improve, though, I'd need to get serious about biking. It was around that time that I also planted the seed for a bike trainer. The one I wanted was the Wahoo KICKR, a steal at $1200! I figured go big or go home. I really wanted the ability to control the trainer so I could do pre-made workouts, and also have the trainer spit back its power data and whatever else it had to share. I really hounded my wife for this trainer, but there was just no way to justify the price (I couldn't justify it to myself, let alone to my wife). I meticulously followed DCRainmaker to get his recommendations for trainers so I learned about the Wahoo KICKR SNAP as soon as it was released, which was a deal at only $700, so I started working my wife over on that one, letting her know when it went on sale for as low as $650 shipped. That price seemed more doable, but it didn't get done. Eventually I re-evaluated what it was that I needed. I wanted something that transmitted power, so I could upload workouts to whatever platform I wanted. I wanted something that would adjust resistance automatically (eventually I fine-tuned that requirement to be ANT+ FE-C compatible, which is the standard for controlling trainers). I found the cheapest trainer that could do those things, build quality be damned, and came up with the TACX Vortex Smart. It was only $530, so that's what I went to work on. After trying to convince my wife for a year to let me buy a trainer double the price, this one was a bit more palatable, and eventually she caved. I ordered from Clever Training to support DCRainmaker since his site was instrumental in making the decision, but they were luckily back-ordered. I say luckily, because it was during this time that I searched for other retailers, and noticed that I could buy the same exact trainer from a German e-tailer for $200 less (shipped), than if I bought it domestically. So I cancelled my order, and ended up buying from oversees. It took forever for the trainer to come in, and when it did, I had to spend a whopping $3 on a new power cord to make it compatible with US outlets, but it otherwise it worked perfectly. My wife was pretty happy that my $1200 request dropped all the way down to $333. I was pretty happy too, especially considering how well the trainer has performed. Probably not a month after that, I got a hit on my Craigslist watch that netted me a used, but in great condition 920XT for $150. I sold my Garmin Swim to offset some of those costs to further please my wife. I upload all of my activites to Garmin Connect, which sends the data over to Strava. I then use a service called tapiriik to propagate those data to Runkeeper, endomondo, SmashRun, and dropbox. I'm contemplating getting a new HRM, specifically the HRM-TRI so that I can get running metrics and also get my HR in pool swims (for some odd reason, the 920XT displays HR during pool swims, but does not record it). However, once again, the price is prohibitive, but maybe something will come up on Craigslist. My biggest want for my next purchase is a power meter for my bike. They keep falling in price, and I'm hoping that something falls low enough so that I can convince my wife. I'm actually not pushing to get one now, because I'm able to do the structured training that I really wanted on my trainer. A power meter would be great during race day, but for anything other than races and casual rides, I prefer being on the trainer.